I never knew that there was so much planning needed to do up a bathroom. When our bath started to leak through the ceiling it was clear that we had to make it a priority. After reading Boo Roo and Tigger too’s posts on doing up her bathroom (especially the ones on tiles and cabinets) it made me realise that we couldn’t just go and pick a bathroom suite and put it in – it needed a lot more consideration. I therefore, have decided to share with readers the thought processes and problems we have been through so far in redesigning our bathroom. It may sound obvious but the first thing you need to consider is your current bathroom. How big is it? Where are the pipes? Do you want a radical change (eg have you only got a shower but want a bath, will you be knocking out or building walls) and what size is your bathroom furniture? What you want to have done will come down to a practical nature and budget. Do you need any work doing first? The first thing we considered was the window (although this can be done later), treated the ceiling and walls for mould, and had an extractor fan fitted. Of course any electrical work needed to be done in the bathroom MUST be done by a qualified electrician. We also stripped the skirting boards ready to repaint them. We also had an out of use heater removed, the old radiator and will have the shower removed/changed. We also know that we have to strip the tiles and the wall needs re-plastering. I really fancied a free standing bath – but the room is not big enough and the pipes are not in the right place. The only way around it is to put it against the wall, but then there would be nothing stopping the water going down the side. Next, after looking at a huge range of bathroom suites, we discovered that a budget (or idea of one) is really important as a bath alone can vary hugely in price. As it happens our bath has taps (and pipes) at one end, and an over-bath shower at the other. This again greatly restricted our choice of baths because we were doing as much of it as possible. Also we did not want the bathroom out of action for too long (we are a family of 6) so do not want it to take too long. The biggest factor on deciding on our bath though was the fact that our wall to wall gap (where the bath goes) doesn’t fit with regular bath sizes. You can generally buy 1600 and 1700 (even 1500 I believe) but our bath is 1670. We considered knocking into our airing cupboard and having a bigger bath, or having a smaller bath with a shelf. However, touch wood, we have found one online to fit (although not with a side panel that fits with it! So we decided to have a Square theme, as we want our bathroom to look modern- giving a sense that we had actually redesigned the bathroom. Square shaped bath/sink/toilet taps, light switch, light, cupboards, etc. We have started top down by repainting the ceiling and having a square light fitted. In fact because the lighting (colour and intensity) is different the bathroom already feels like it is better. We wanted chrome taps, radiator and shower (I have since seen a square one but think there may be an issue with it not being suitable for my bathroom. We looked at many places before deciding on our theme, taking with us The Sensory Seeker. We decided on white bathroom suite and walls (with larger tiles). I did read that we need a similar colour floor tiles because our bathroom isn’t massive, but we have currently decided to have a laminated effect. Also with the tiles we had to make the decision as to whether we will tile throughout or paint some of it. We are going to go with black bathroom accessories – towels, mats, shower curtain, toilet brush holder, toilet roll holder etc. We still need to sort storage but I would like a mirror cupboard on the wall (high up to keep things like razors safely out of harm’s way) but with doors that open outwards instead of sliding (as things fall down and stop the door opening). Ideally I would like everything put in cupboards instead of on display. We also keep our dirty washing in the bathroom so need a wash box to complement the rest of the theme. Next we need to buy the tiles, the bathroom suite and crack on. Eventually we are going to replace the door too. Is there anything else we have not considered please? Is it Time we thought differently about Breastfeeding? I like bathrooms that are white and big with lots of light. It’s tricky isn’t it? Our main design problem is that we don’t want a shower curtain, but want a bath screen, but there’s a window in the way where we want to put it. I just wish I didn’t have an en-suite! I’d rather have one bathroom and a bigger bedroom! 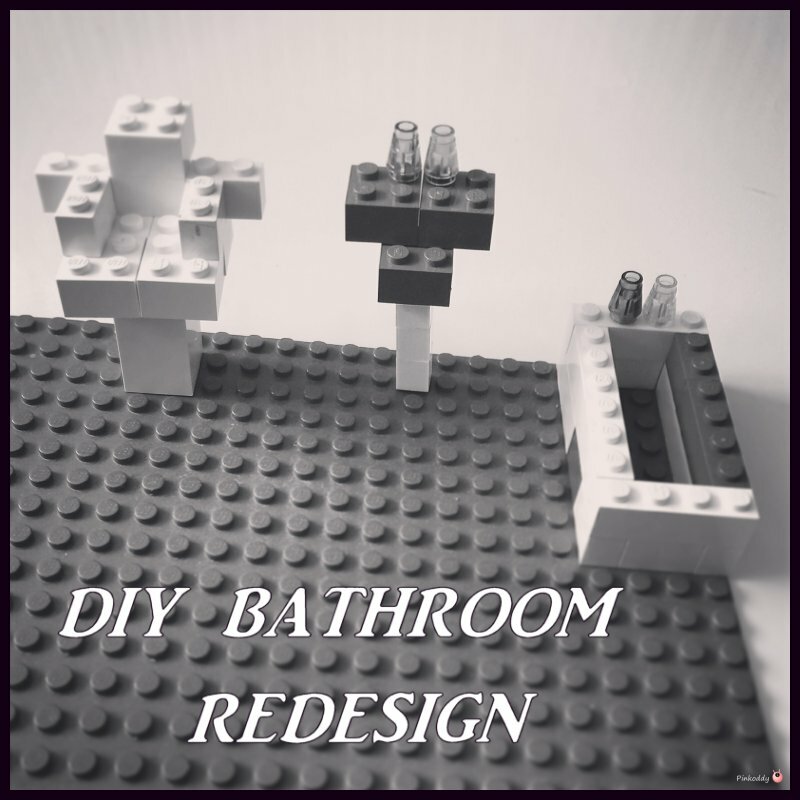 We really need a new bathroom but I think a LEGO one is about all we can afford at the moment! I wish that we had a bigger shower in our ensuite. One day we will. I love the idea of planning it with lego! we loved updating our bathroom .. picking new fittings was lots of fun .. *cough cough* … although hubs was just painful! We changed a bathroom a couple of years ago and my advice would be to go over your plans with whoever is fitting the bathroom before you order anything. They might see something that you’ve missed. Also buy everything from one place and negotiate a discount. We bought our stuff from a plumbing supplier which a builder recommended to us. I hope that it goes well! I’m hoping to change our bathroom this year. The suite is pink and very dated! I’m looking forward to doing our bathroom in so many respects, just not the actual work lol. Imagine that lego underfoot and that bath not a great idea lego bathroom.. jokes! our bathroom is so outdated and peach its almost vintage!!! I’d love a free standing bath too but like you, just no space. My bathroom is purple and white and makes me smile every time I enter. my dad practically swore when he redid our onsuite as nothing was standard size so I feel your pain! I would also love a freestanding bath and dream of the day I can have a lovely big bathroom with one in. One day!! There is so much to consider when revamping a room, it really can make your head spin! Your ideas sounds lovely, I hope you manage to get it all done without it becoming a major headache. Oh we are looking at redesigning our bathroom and will also be doing as much of the work as possible. Would also love a free standing bath but our bathroom is tiny.